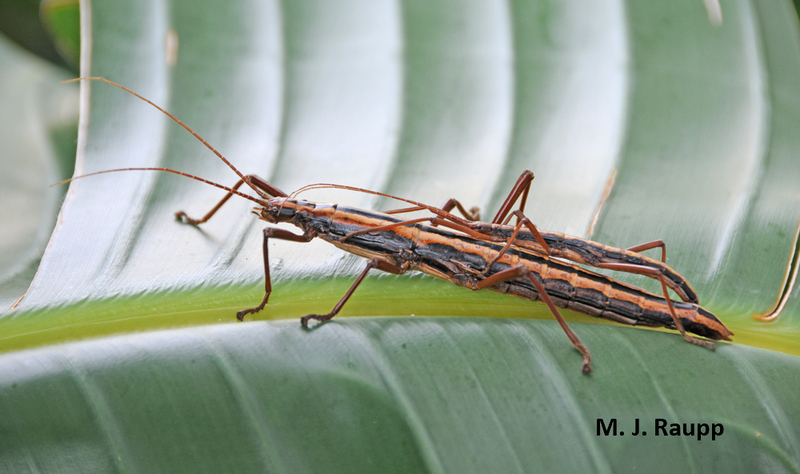 The female walkingstick dwarfs the male riding on her back. This week Bug of the Week hits the road to escape winter’s chill and explore warmer climates where insects are bugging out. Our first stop is Hutchison Island, Florida, to visit the twostriped walkingstick. These giants of the insect world are among the largest insects in the continental United States. One gorgeous female I captured was almost four inches long. Twostriped walkingsticks enjoy a vegan lifestyle dining on leaves of crepe myrtle, roses, oaks, rosemary, and several other trees and shrubs. While the details of life of this curious insect are not fully known, autumn is the season when mating pairs are most abundant. In addition to their notable markings, one striking feature of these beauties is a curious discrepancy between the size of the females and the size of their mates. In the world of mammals and birds, the general rule is that males of the species are larger than the gals. However, in the realm of insects and spiders, when it comes to size, females are often larger. Does size really matter and, if so, what forces shape large females and smaller males? Several explanations have been proposed to help explain these size differences in insects. For many insects, there is often a direct and increasing relationship between the size of the body and the number of eggs a female can produce. Big mammas simply leave behind more offspring than small ones and thereby gain an advantage in the evolutionary game. This may be accomplished by molting an extra time relative to the male and spending slightly more time growing and becoming larger than their puny mates. The males of many insects have a slightly different situation. Their contribution to the mating game is rather small, just a deposit of sperm to fertilize the female’s eggs. Rather than battle other males for a chance to mate, being at the right place at the right time may play an important role in the walkingstick’s mating game. Rapid development may allow a small male walkingstick to gain an advantage over larger ones. By being the first of his cohort to reach maturity, find a mate, and win her affections, a small male may father more offspring than a larger one. With their remarkable size, one wonders how an insect so large goes unnoticed by scads of hungry predators that might like to make it a tasty meal. Like many other bugs we have visited, such as stink bugs, Eleodes beetles and Nasutitermes termites, twostriped walkingsticks pack a potent chemical wallop. Just behind the creature’s head are small openings to underlying glands. When under attack the walkingstick can discharge a highly irritating secretion from these ports. Upon capturing the large gal featured in this episode, I was treated to a discharge of an unctuous liquid across the surface of my hand. While this caused me no real discomfort other than a smelly hand, one unfortunate human who was apparently eyeballing a walkingstick experienced a rather nasty surprise. A quote from a scholarly account of this incident includes the following: “The pain in his left eye was immediately excruciating; being reported to be as severe as if it had been caused by molten lead.” Although I suffered no misfortune by these beautiful creatures, caution should be observed when handling them and please don’t look them in the eye. Twostriped walkingsticks discharge noxious secretions from an opening just behind the head. The following references were used in preparation of this episode: “Behavioral causes and consequences of sexual size dimorphism” by Wolf U. Blanckenhorn, “Achieving high sexual size dimorphism in insects: females add instars” by Toomas Esperk, Toomas Tammaru, Soren Nylin, and Tiit Teder, and “Defensive spray of a phasmid insect” by Thomas Eisner.